So I went to get dressed for work this morning and decided I’d wear my long black skirt (because, well, I haven’t shaved my legs okay! And I can’t wear a shorter skirt with un-shaved legs, let’s be honest here…) Now I knew that this skirt was too big for me (partly due to weight loss, partly due to the elastic finally dying in the skirt) and I knew that I was going to have to wear a belt with it, so I didn’t have any more wardrobe malfunctions like I had last week when I wore it and discovered it hanging halfway down my hip as I’m crossing the main street in town (can we say embarrassed!). 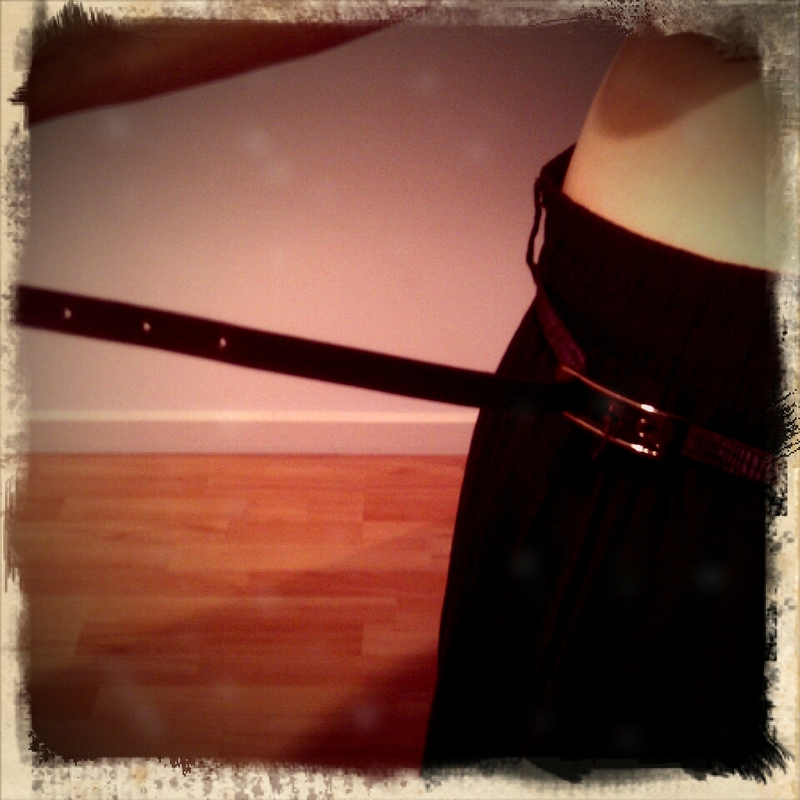 I rummaged around in my drawer until I found my one and only lonely black belt – my one and only belt full stop actually. Finally found it and looped it through all the belt loops and went to do it up when ‘lo and behold – Houston we have a problem! The belt no longer fits me. Oh, but it’s not too small like you might be thinking! No indeed, it was too big! There I was standing in my bedroom holding this damn belt out and wondering how the hell I’m going to wear it, when I gave up and found a scarf to tie my skirt up with instead. But not before I got Mick to take a photo of me wearing it though. I’m a little chuffed to be honest. I’ve been studying myself in the mirror and I know that I’ve lost weight – the scales tell me so (except this week, they were right bastards this week) and my tape measure tells me I’ve lost centimetres, but when I examine myself in the mirror I just don’t see any changes. Maybe a little in my face, but otherwise, I see no changes. So it’s lovely to have that proof smack bang in my face (and now in yours…) that yes, my healthy eating and attempts at exercising are working for me. This gives me more motivation to just keep going. Brilliant effort! I lost weight (lots of weight) a few years ago and had the best time trying all my old clothes on one day, realizing that nothinng fit and I had to buy a whole new wardrobe. It is the best feeling!! That’s Awesome Tina!! Go you!! 3.9 away from double figures! Your doing so well!